Neu! - "Neu!" / Neu! - "Neu! 2" / Neu! - "Neu! '75"
In the 90's, early 70's German duo Neu! became one of the hippest bands to quote as an influence, and was cited by artists as diverse as David Bowie, Stereolab, Sonic Youth, and the Red Hot Chili Peppers. Curiously, Neu! 's classic work (three albums recorded in the 70's) remained out of print and nearly impossible to find throughout the entire 90's. It's only now, in 2001, that a new generation of music fans can finally hear what all these modern artists have been talking about, and the only comment that can truly sum it up is, "It's about time!" 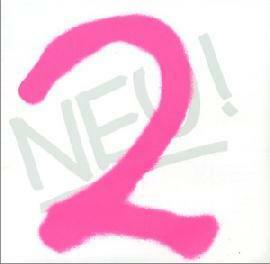 The first self-titled Neu! album (1972) is a visionary and innovative near classic of studio recording, replete with motorik beats, pre-ambient styling, and early industrial crunches. Listening to it now, it seems hard to believe that it was recorded almost 30 years ago. 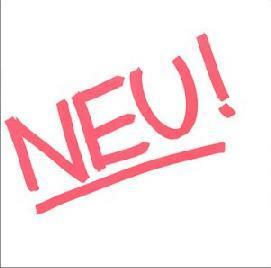 While Kraftwerk's classic Autobahn seems to revel in the joy of careening along the infamous German highway, Neu! 's music, if anything, seems to capture the monotony of driving, late into the dark night, through a barely discernable landscape. The sparse ambient melodies, and twisting, fading guitar trimmings of Hallogallo are driven along by a hypnotic, metronomic beat. Weissensee (White Lake) rolls along in slow, undulating waves of slide guitar, while In Gluck (In Luck) is an almost ambient coda to that piece. In shear contrast is Negativeland, arguably the great grandfather song of all industrial music. With its grinding machine-like noise, throbbing beat, urgent scraping guitars, and shrieking effects, it's a 10-mintue mindblower, leaving the last piece, the quiet Lieber Honig (Dear Honey), with fey guitar, and odd, strained vocals, as almost an afterthought. When the album is working (as with Hallo Gallo and Negativeland), it bristles with a hidden, edgy power that gets under your skin and into your nerves. Strangely though, the lesser ambient pieces, rather than detracting from the work, only serve to emphasize the raw energy and thrilling intensity of the album's better moments. Neu! 2 (1973) is a sort of "meta-recording", a recording of music about the recording of music that challenges the music industry head-on. Running out of funds halfway through production, rather than shelving the project, Rother and Dinger decided on a revolutionary approach. In a brilliantly subversive move, they "remixed" the pieces they had already recorded in order flesh out the album's length. What we are left with is a few solidly recorded compositions, and a bunch of weirdly altered pieces that sound suspiciously familiar, yet have a sense of the alien about them too. The music slows down to droning extremes, speeds up to frantic Chipmunkian intensity, and sometimes abruptly ends in a screech of chewed magnetic tape, only to recover itself from editing room oblivion to start again. 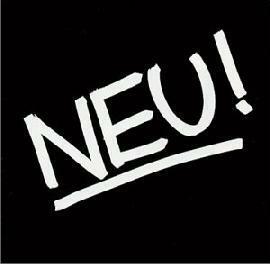 In between all the reconstructive anarchy are some truly classic Neu! tracks. Für Immer (Forever), the centerpiece of the album, is 11 driving minutes of pure Neu! With its hypnotic beats and swirling guitar textures, it stands as one of the finest pieces this duo ever recorded. Lila Engel (Lilac Angel), with its minimalist, percussive vocals, repetitive riffs, and steadily building rhythm contrasts nicely with the mellow, and melodically simple Nueschnee (one of the tracks re-mixed on other parts of the album). Super kicks off with a distorted, self-referential vocal, and quickly vaults into a smoking, abrasive proto-punk romp to close the album. Unfortunately, it was the very extremes on Neu! 2 that were driving the two musicians apart, and the fragmentation became glaringly obvious on Neu! '75. Even the pictures of the two band members on the inside of the liner serve to underscore this division, with Michael Rother, the bearded, ponytailed hippy with his tranquil expression and half smile, set against a white background, compared to the darker Klaus Dinger, wearing sunglasses, a slight sneer curling his lips, looking like he's ready for the 80's five years ahead of schedule. The album gets underway with the kind of bright, melodic electronic excursion that would characterize Rother's later solo work, well into the 90's. Contrast this with the album closer, After Eight, which is pure proto punk in the finest early Ramone's tradition. In between, we jump back and forth between these two extremes, as Rother and Dinger seem to battle it out. The tension is undeniable, but so is the quality of the songwriting. The disintegration of Neu! only served to fuel their artistic energy. While Neu! '75 may not be quite as innovative as their two early albums, it still stands as a remarkable work of two musicians performing at the peak of their creativity. See Land is a dark and brooding meditation, perhaps the most effective piece of this nature Neu! ever did. Leb' Whol begins with cool, arppegiating piano runs over gentle waves (the sound of waves seemed to emerge as an ongoing leitmotif in most of their more ambient pieces, on all three albums) and later adds distant, melancholy voices and a soft, tic-toc like beat. Hero is a rough rocker, with Dinger (?) screaming throughout. E-Musik seems to be the only piece here in the classic Neu! mold, with the hypnotic beats and minimalist sonic structures that characterize their earlier works. Even though each album checks in at only about 45 minutes each, Dinger and Rother have wisely dispensed with adding the obligatory "never before released tracks" to fill out their CD length. These albums stand on their own, and to append anything to them would detract from their uncontaminated beauty and uncompromising intensity. These three albums are essential to any complete understanding of alternative music in the last quarter of the 20th century, but remain fresh, accessible and exciting to listen to, even today. For more information you can visit the Astralwerks Neu! site at: http://www.astralwerks.com/neu.